A 'supportive' friend gave us a ton of random holiday music, compiled from who knows where, near the end of last year's Mainlining project. Much of it was unique, or terrible, or - like this - both. So, uh, "Thanks", I guess. This is one of the weirdest, most nonsensical things I've ever listened to. The fact that this even exists blows my logic circuits, so to speak. Okay, lets start off by saying that all of these songs are awful. I could have written better Star Wars Christmas songs as age six. Because even at six I was reluctant to make rhymes just by repeating the same words over and over again. Also I feel bad for Anthony Daniels, the only voice actor with the misfortune to be involved with this. Maybe he really got a bad deal in his initial contract? It seems like he did a lot of these sorts of odd appearances. 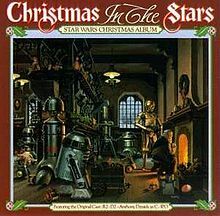 This is also horrible because it even dispenses with the Life Day cover story, and just decides that droids make presents for Santa, and everyone celebrates a sort of nonspecific holiday called Christmas about gift-giving and love? I hate it when people can't even be bothered to hand-wave in an explanation. What happened to a galaxy far far away? Christmas in the Stars exemplifies all the things I described above. It's just a flat out terrible song. Bells, Bells, Bells: Here's a definition of bells, actually suitable for droids: a percussive musical instrument consisting of a metal outer shell and an inner piece that strikes the shell when shook, producing a tone. There, I saved you time and idiocy. The Odds against Christmas: Wow. Someone actually wrote this awful song. I mean, in idea, execution, everything, it's just hideously bad. This one also has the highest percentage of random Earth stuff. There's a line in here about how lucky Earth is to have Christmas, but in all the other tracks, everyone has Christmas, so...I give up. What Can You Get a Wookiee for Christmas (When He Already Owns a Comb? ): This is stupid, but the sheer weirdness of it makes it slightly less annoying than some of these other tracks. The internal logic is dumb, but at least it exists. R2-D2 We Wish You a Merry Christmas: These songs get weirder and weirder. Now a scary child chorus and some dude with a soft-rock voice are singing a gift to R2. Or something. Sleigh Ride: Arrgh. This is so painful to listen to. Why is a character who cannot sing talk-singing about singing? I'm embarrassed on behalf of everyone who was involved in this. Merry, Merry Christmas: More from the elf-droids, or whatever they are. At least this is less offensively bad than the rest of the songs. It's even almost funny, occasionally. A Christmas Sighting ('Twas the Night Before Christmas): This is a restyling of the poem casting C3PO as the narrator. It's actually kind of okay, and the best use of the character on the album. And then there's a terrible ballad. A really terrible ballad. The Meaning of Christmas: The dude with the bad rock-ballad voice is trying, here, to create something meaningful, that will have resonance beyond some gimmicky record, that will have some deeper meaning. They're really trying. But they're failing. Really failing. It's just excruciating to listen to how hard they're failing. Worst Songs: odds, bells, stars, sleigh... are there any more? Do not subject yourself to this, unless you have a high tolerance for terrible music and a taste for the completely strange. It flutters around the so-bad-it's-funny line, but I think your feelings about singing on pitch and Star Wars will determine which side of the line it falls on for each listener. As in, the more you like those two things, the less you will like this album.